The Choptank River Watershed is located on the western edge of Delaware and resides in Kent County. The headwaters of the Chester River lie to the north and Marshyhope Creek is to the south. The Choptank River Watershed consists of Tappahanna Ditch in the northern portion of the watershed, Culbreth Marsh Ditch in the center, and Cow Marsh Creek in the lower portion. Both Tappahanna Ditch and Culbreth Marsh Ditch drain to Mud Millpond, which is situated at the Maryland-Delaware state line. The pond discharges to the Choptank River in Delaware, which meanders southward, where Cow Marsh Creek connects in before continuing into Maryland. 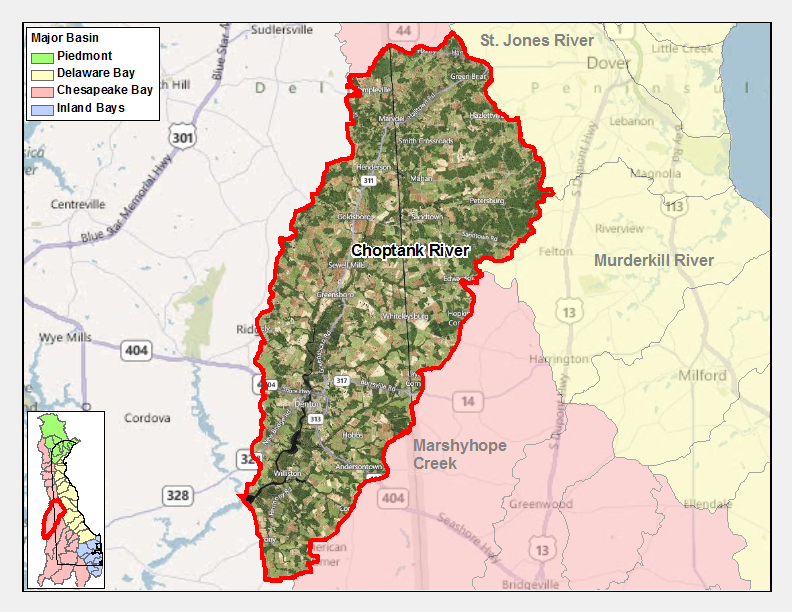 The drainage area of the Choptank River Watershed within Delaware is approximately 97 mi2. 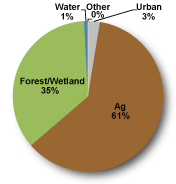 The land use in the watershed is dominated by agriculture, wetlands and forest. The riparian habitats associated with the Choptank include some of the finest and most diverse habitats in Kent County and are home to many species or rare plants and rare animals. Concerns in the watershed include low dissolved oxygen, nutrient over-enrichment, and high levels of bacteria. There are no active point sources discharging nutrients or bacteria into Choptank River, therefore, all pollutants are coming from nonpoint sources. The designated uses for the Choptank River Watershed include primary contact recreation, secondary contact recreation, fish, aquatic life and wildlife, agricultural water supply, and industrial water supply. Nutrient TMDLs for the Choptank River Watershed include a yearly-average cap on total nitrogen at 1,359 pounds per day and a 40% reduction in phosphorus levels. Also, the nonpoint source bacteria load in the Choptank requires a 29% reduction. The Choptank Watershed has two sites listed in the Site Investigation and Restoration Section database. Both of these sites are Voluntary Cleanup Program (VCP) sites. If you would like to view reports for any of the sites in the SIRS program please follow the link theDNREC Environmental Navigator to search by map for the Choptank Watershed. The majority of the streams within the watershed have drainage ditch characteristics due to the surrounding agricultural practices. The exceptions are found near and downstream of Mud Millpond, which is more forested. Soil types in the watershed include predominantly Pocomoke-Fallsington-Sassafras soil associations described by the Natural Resources Conservation Service as "very poorly drained, poorly drained, and well drained soils that have a moderately permeable subsoil of clay loam to sandy loam," and Fallsington-Sassafras-Woodstown associations described as "poorly drained to well drained soils that have a moderately permeable subsoil of sandy loam to sandy clay loam."